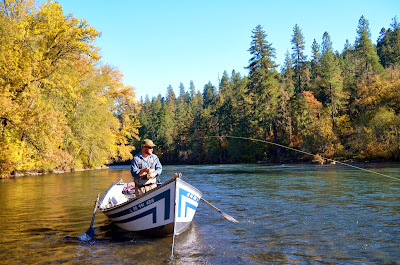 I know this isn't fly fishing, but you have to admit that the Rogue River and its Fish are cool! And yes Im doing NOTHING today, which is nice as the River gets crowded on the weekend! Been there, Done that, Wanna go Back!!!!!!! 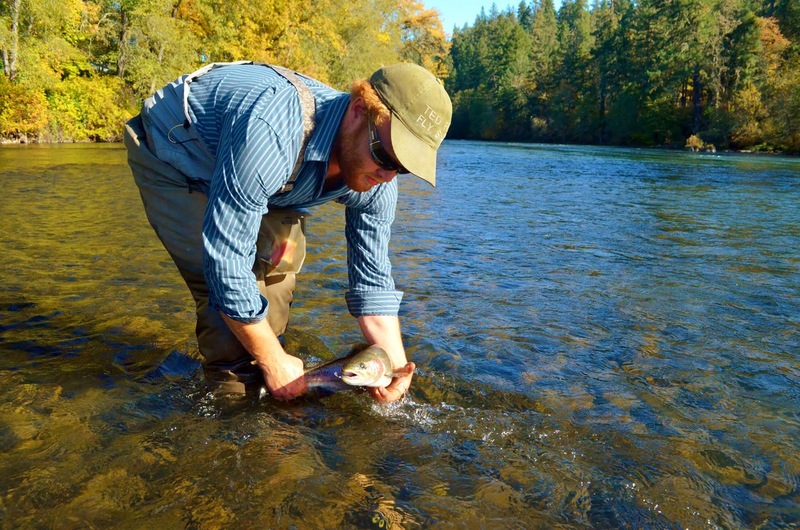 I spent two years in this magical place, if you like Salmon, Steelhead, and Trout you need to go! "The Kodiak Project" trailer - by LDR Media | Fly Fishing Movie from The Fly Fishing Film Tour on Vimeo. Labels: rogue river steelhead guide, Rogue Steelhead, Spey Fishing Guide, Spey trout fishing, steelhead fly fishing, Swinging for Rogue River Steelhead. 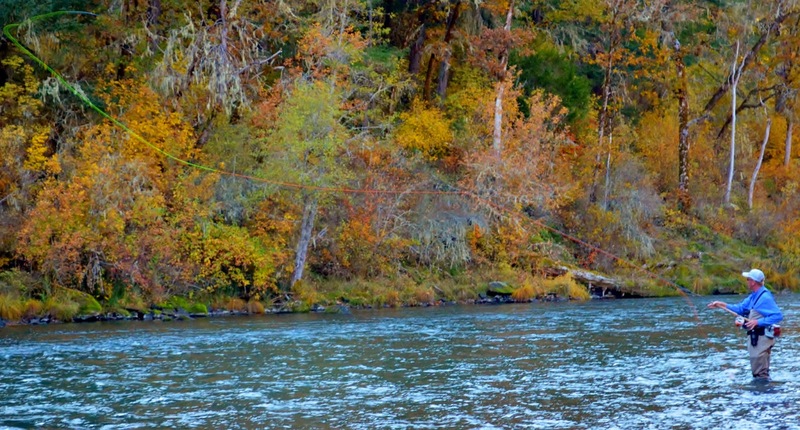 The Rogue River is rolling. I was allowed to be a part of a family fishing trip yesterday--being a part of these memories is what makes guiding so much fun. One of the things Nathan and Don will talk about for ever is Nathan's First steelhead. 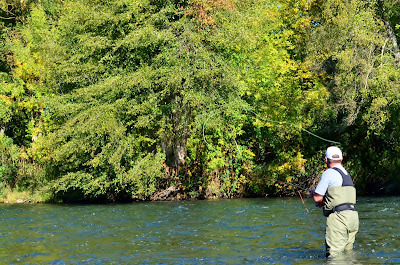 We were drifting flies through the run when Nathan's line paused and looked as if it was hung on the bottom. He started to take up slack and I said " looks like you got the bottom." 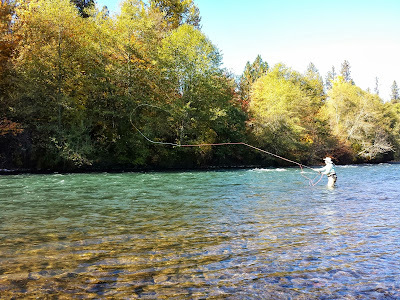 As Nathan pulled the slack in, it looked like he had snagged the bottom up river, I started to say, "yep, its the bottom," but before I could get "Bottom," out of my mouth a nice male steelhead makes a rocket jump, pulling Nathan's line out of the water with it. 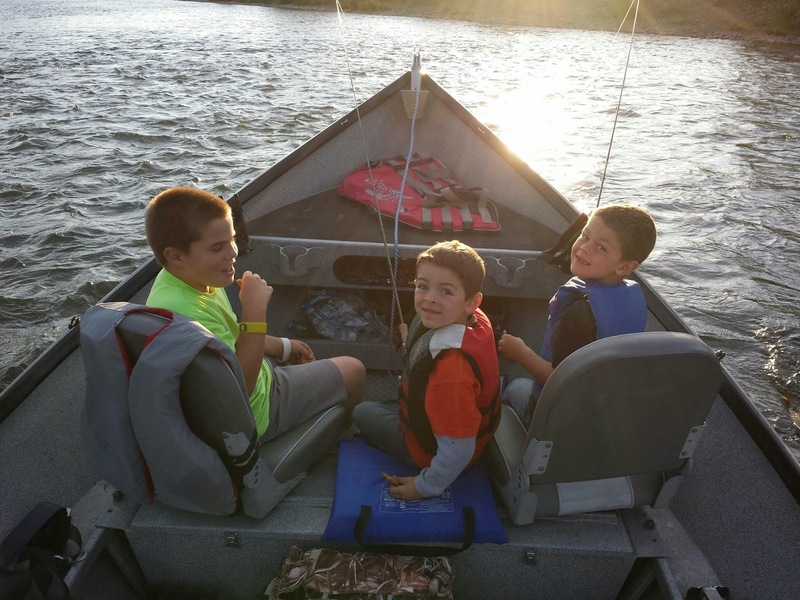 I could see a mix of joy, and controlled panic on Nathan's face as he followed my instructions as to how to fight the fish on the switch rod. 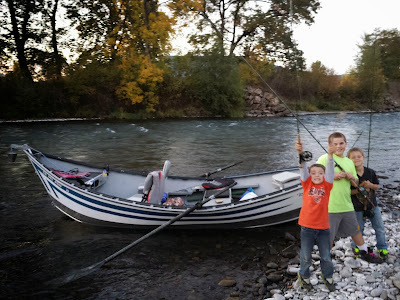 6 crazy jumps, a couple good runs, and about 10 minutes later Nathan was able to put his hands on the Rogue River Brute--His First Steelhead Ever! The day ended well. 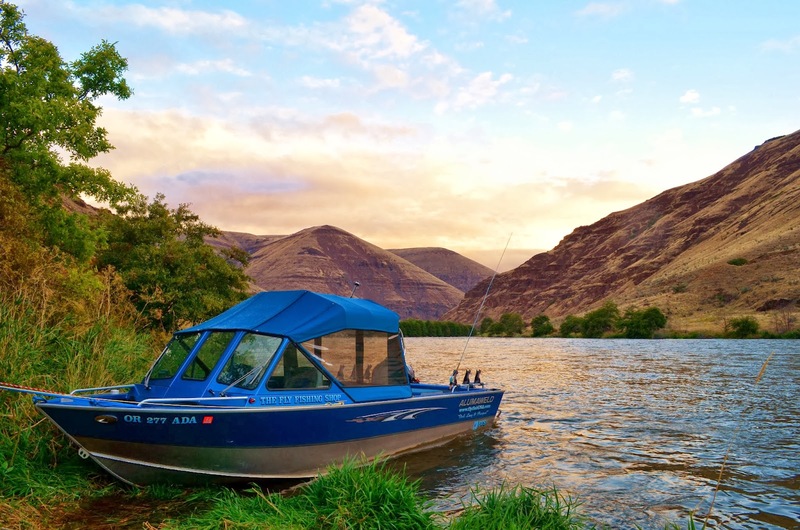 There were six clients spread over 3 boats, drifting different sections of river that were over 30 miles apart, and all 6 scored a steelhead--some multiple fish--two of which caught their first steelhead. This is almost unheard of in the steelhead world, but not on the Rogue River! Have I mentioned lately how much of a blessing it is for me to be able to guide such a river system?!? What a Great Day, with Great People, On a Great River!! The Rogue River has runs that go for ever! 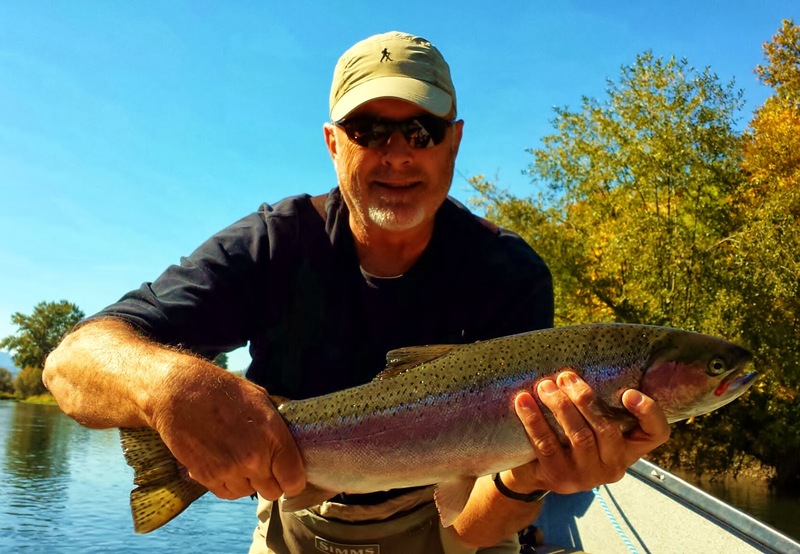 Classic Rogue River Steelhead Water! 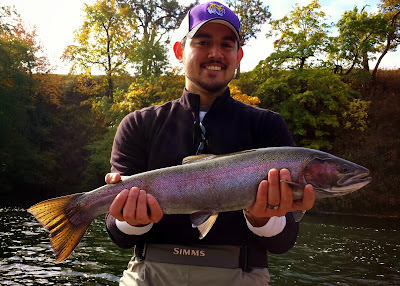 Nathan's First Steelhead--He will never forget the Rogue River after this one! 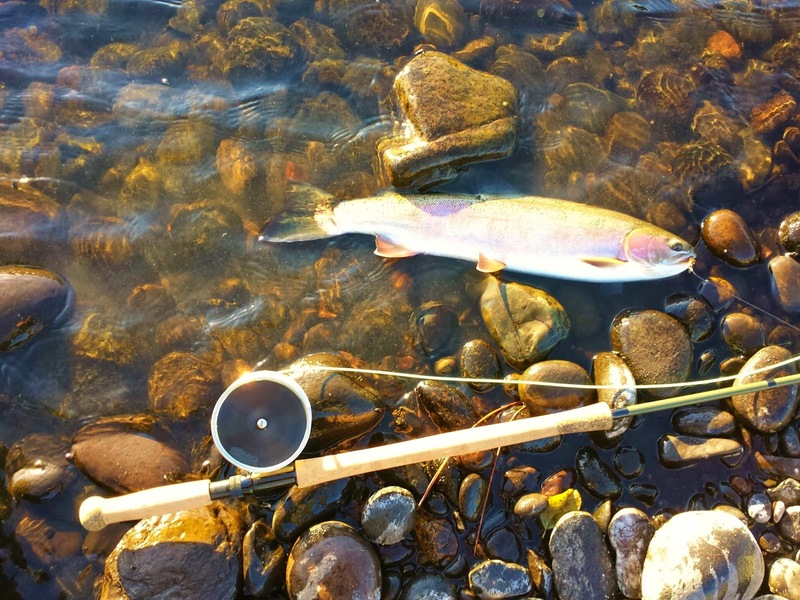 The last couple of weeks have been a whirlwind of spey fishing. 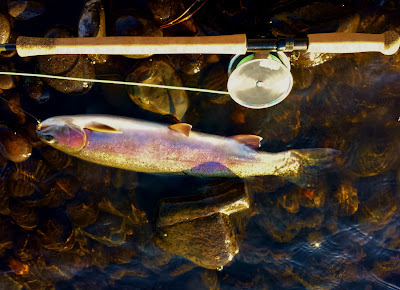 I won a trip from Mark Bachmann, and a Echo TR7130 rod from the Fly Fishing Shop in Welches. 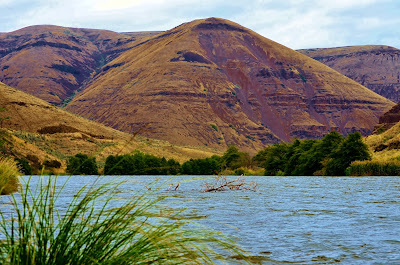 I knew it was going to be a hard trip when I spent the majority of my time traveling from Southern Oregon in the rain, but I didn't fully grasp the severity of the precipitation until I saw the White River dumping its chocolate flows into the already swollen Deschutes. Gage, my son. and I didn't let it get us down as we reminded ourselves--we are going fishing with Mark Bachmann. we pulled up to the Macks canyon ramp and found the blue Alumaweld patiently waiting as we were 15 minutes late--the Access road kicked our butts. I had fished the Deschutes as teen for redsides, but I nearly forgot how beautiful the canyon was. Mark, expertly, took us through several rapids and explained some the the sights along the way. The trip down river was full of everything eastern Oregon can offer. 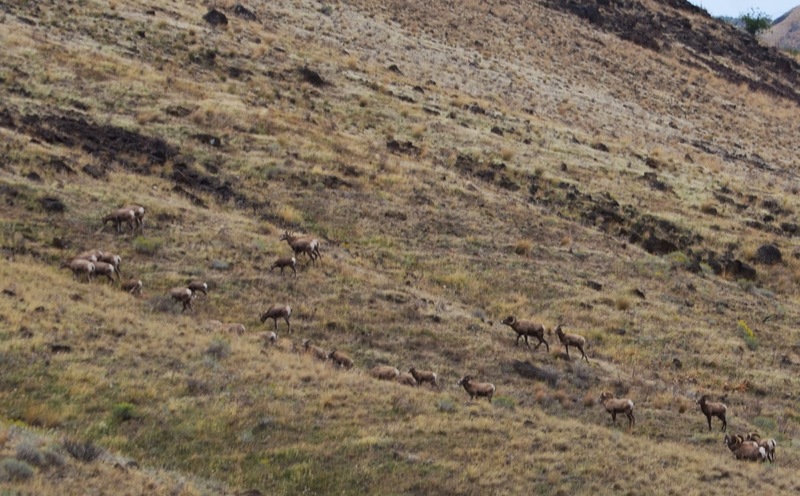 Huge open vistas that contained a ton of wildlife for the trained eye. Patty, Marks copilot, navigator, and wife, had an eagle eye as she pointed out herds of Big Horn Sheep that were invisible to the rest of us. After 30 minutes of absolute beauty the boat cruised into camp, to a pillow soft landing. To tell you the truth I wished the ride could have gone on longer as I was captivated by the beauty of it all. We off loaded the gear, were given the grand tour of the camp, then were told to grab lunch before we headed out. The sandwiches were so good they almost made me forget why I was here, until Mark said, "Nate , Ill take you and Gage a up the River and see if we can get a steelhead on that new rod." The wind was relentless, and the water darkening by the hour but there were several small pockets behind ledges that Mark pointed out . I had a heck of a time with the Skandi line in the monsoonal winds, as I hardly ever fish a full floater on the Rogue, and haven't Played with a Skandi of ages, but I did manage to get some fishable cast out. I swung the whole run, and Gage followed. About half way through I heard a Whoop upstream, Gage missed a massive take--partially my fault because I had for got to tell him to let the fish have the fly for a bit before setting the hook. Disappointment was painted on his face, but I could also tell that he had been hit by the swinging bug. I think Mark could tell also as he spent a bunch of time refining techniques that I had already tried to teach my teenage son--its funny how much better teens will listen to someone else's instruction during this time of their life. Mark had Gage fishing effectively in just a few minutes, something I have tried to do for several trips. 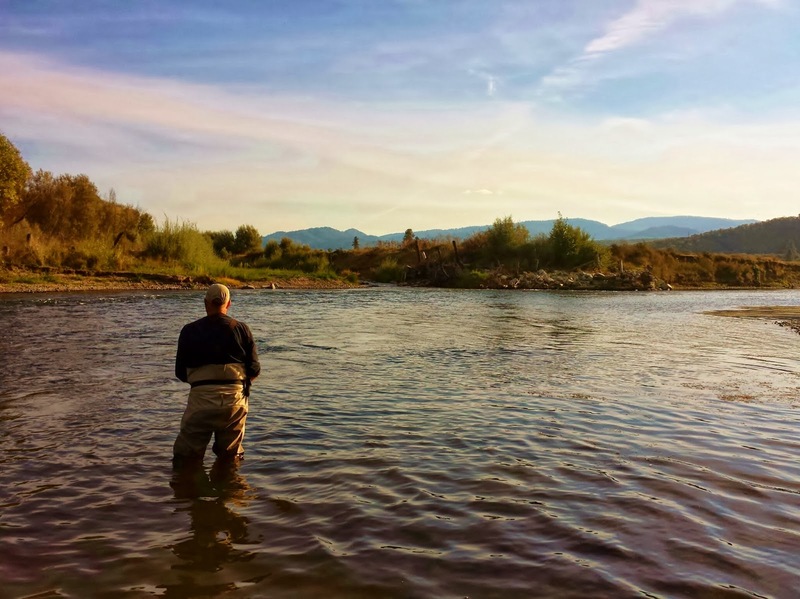 We fished the rest of the evening with no avail as the river was so out of shape that you couldn't see your foot in knee deep water. 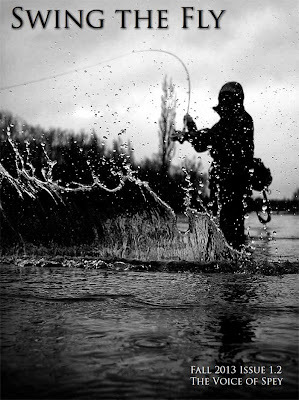 I tried to fish the next morning, but really it was just casting practice. 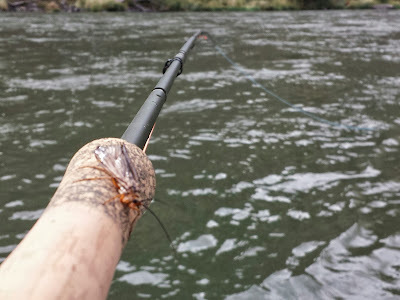 I wanted to catch a fish on the new rod so bad that I spent half the morning swinging a huge leach in the chocolate milk the Deschutes had turned into. At 11:00 I gave up and told Mark I would Fish the rod on the Rogue when I got home, maybe I could even get a fish picture with it. We loaded up all the gear, and enjoyed the ride back up the canyon. 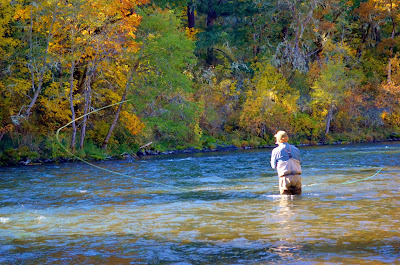 I wish I had time to stay until the river dropped as I know we would have been into fish. 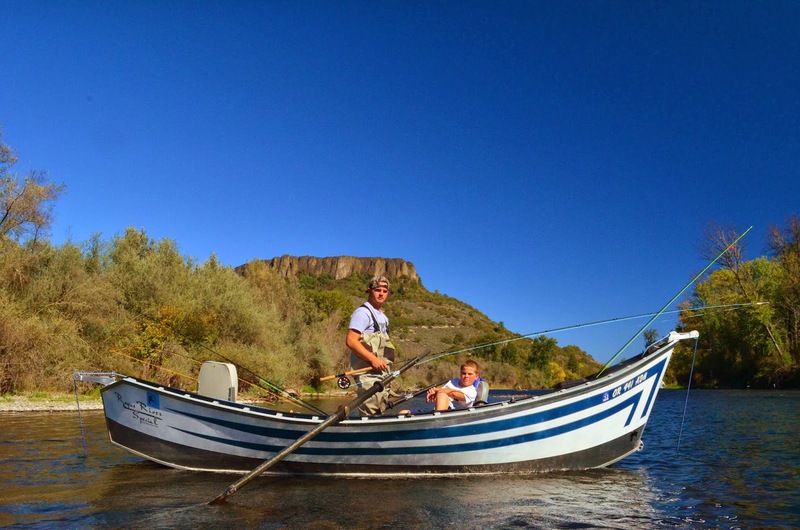 Mark is a Great Guide, full of knowledge, and fun to fish with. Patty Knows how to keep the camp comfortable and was full of great conversation, as well as an excellent cook. 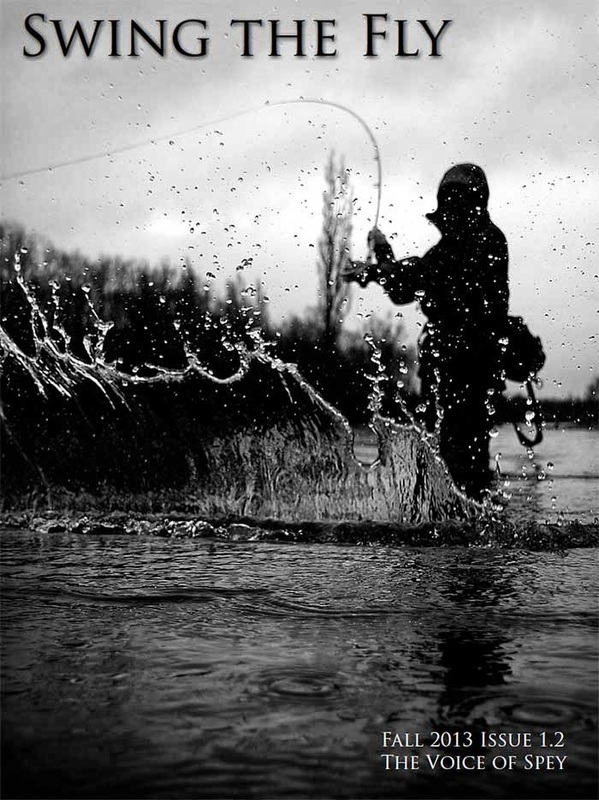 The outdoors are never fully predictable, and as a guide I see that all the time. I have seen the bite turn completely off in under a hour. We have gone from catching loads of huge fish one minute to nothing for days at a time. Sometimes the river just gives you lemons. That's what happened to us, but we never felt it because of the expert hospitality of our host. There was never a dull moment. The lack of fish-able conditions just allowed us to visit more, I probably learned more on this trip about fishing, conservation, and life in general than I would have if the fishing had been good. Mark and Patty were dealt lemons which they made the best lemonade from--this is a true testament to their character, and experience. 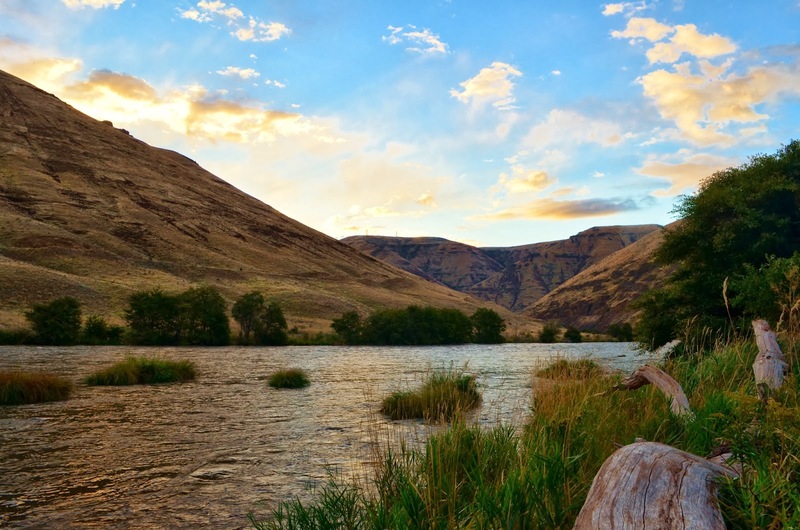 If you want to enjoy the Deschutes you owe it to yourself to Give The Fly Fishing Shop a call and take one of their camp trips, if you do I guarantee you will be talking about it for years--fish or not. 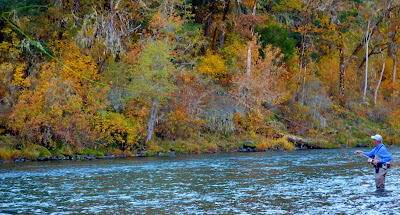 It had been almost a week, and I hadn't been able to fish for myself to fulfill my promise to Mark, to get a picture of a steelhead caught on "The Fly Fishing Shop Rod," But yesterday my sons and I were able to sneak down the river to a spot I knew would lend itself to the skandi line--we don't fish full floaters much, as the Rogue differs in structure to the Deschutes. The holding water is more pool like, but we shot to a run I knew might work below Tou Velle. With the full floater I still felt like I wasn't covering the water well, so I put a fast sinking poly leader on the skandi compact, but between it, and my bunny leach, the poor line was over powered. 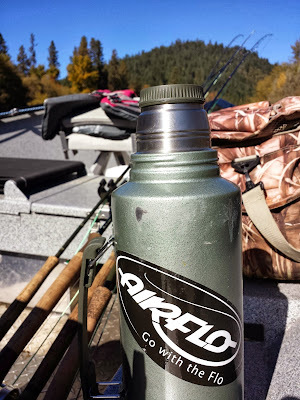 Wanting to keep things in "Deschutes" fashion, I decided to try the Airflo Rage I had bought for the trip, from The Fly Fishing Shop, and it worked. 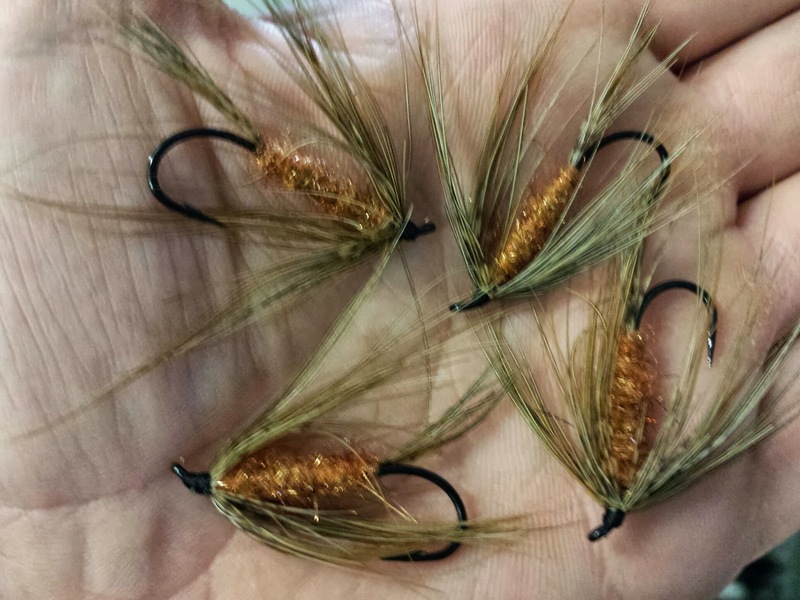 The heaver tip turned the fly over even know I was pushing it past its designed intentions as a full floater, but true to my word, I wanted to Catch a fish "Deschutes" style--even if I cheated with the addition of the fast sinking poly leader. I worked through the riffle until a smashing grab almost caught me by surprise. The boys hooped as they saw the whole thing unfold before their eyes. The Wild Hen made several screaming runs and finally came to the beach. I took a picture of the fine fish, we admired its beautify and released it. So after a week I finally got to put my Fly Fishing Shop Rod to the test and it performed well. 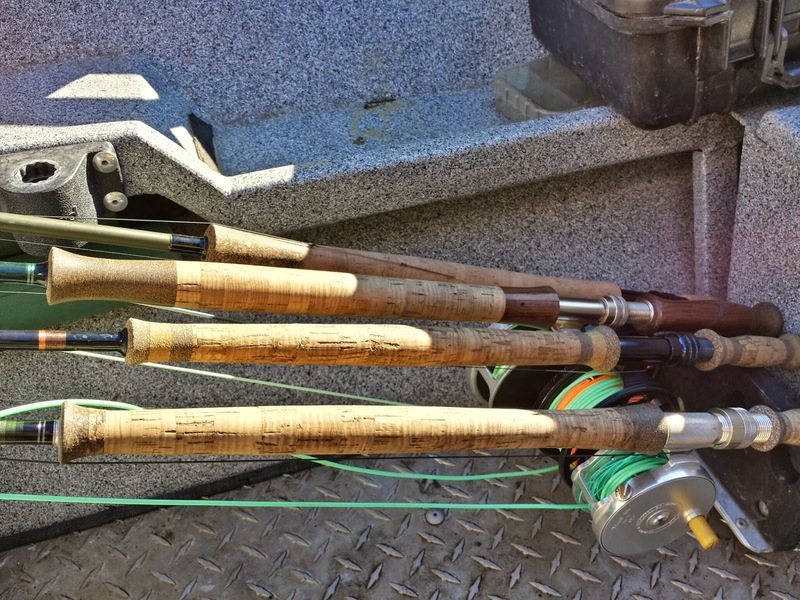 Echo Makes a Fine product and this rod is no exception, pared with a Airflo 480 Skandi, or a 510 Airflo Rage this rod casted like a dream. Thanks Mark, Patty, The Fly Fishing Shop, and Echo Rods you have made memories that Gage and I will never forget. I just couldn't get over the Canyon! What a great view to fish by! 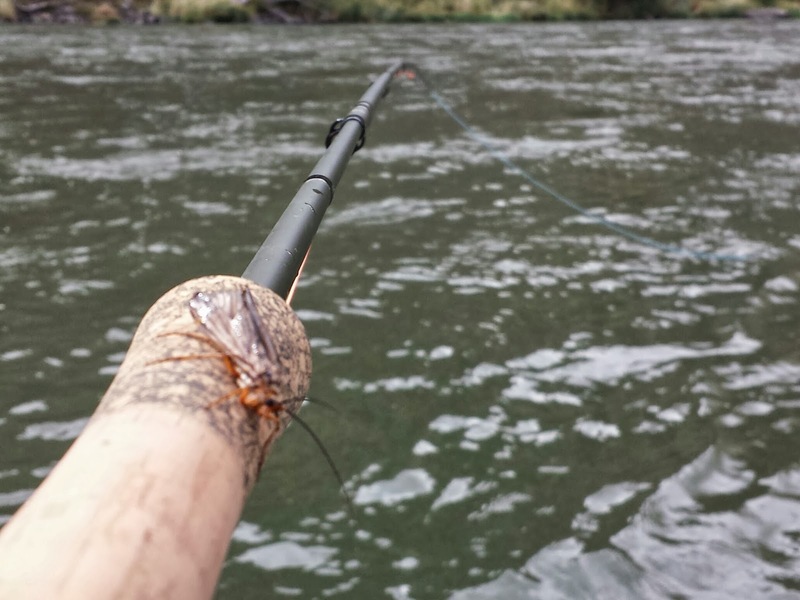 Switched to the Rage on the Rogue River. Nice Rogue River Spey Caught Hen, Deschutes River Style...well almost. 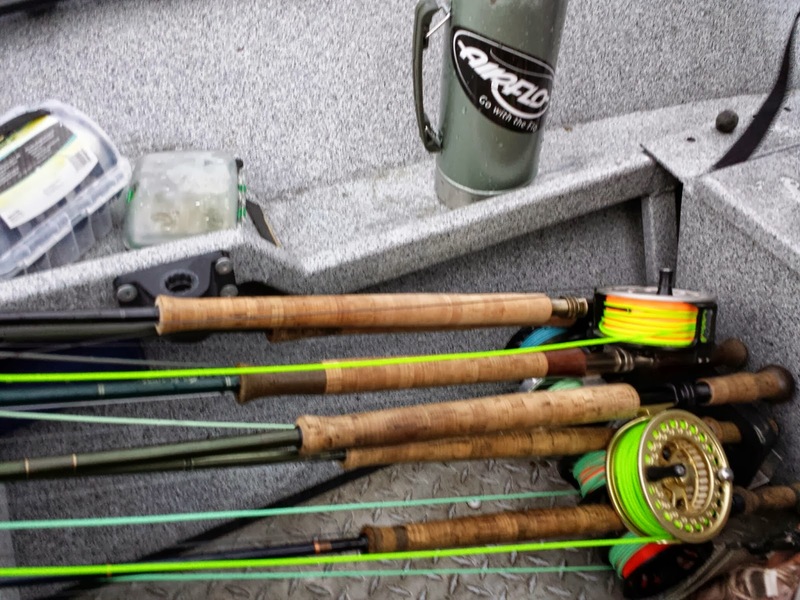 "The Fly Fishing Shop Rod" as Ive Named it-- Echo 7130. No, not Santa! Fall! 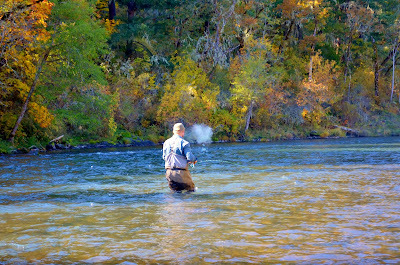 It means Summer Steelhead on the Rogue River, and October Caddis! A combonation that can be some of the most fun you'll have. 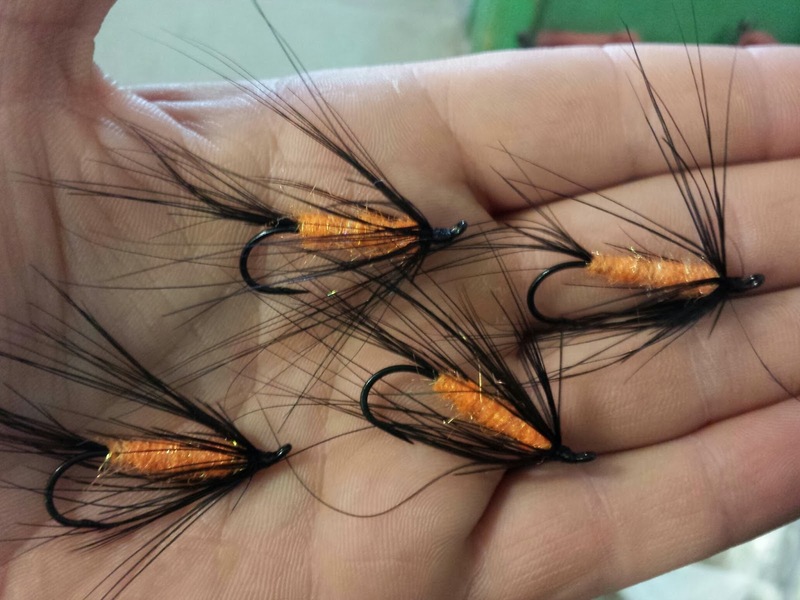 Orange seems to be the theme of fall, and the fish often agree, as they find swung pumpkin flies hard to resist. 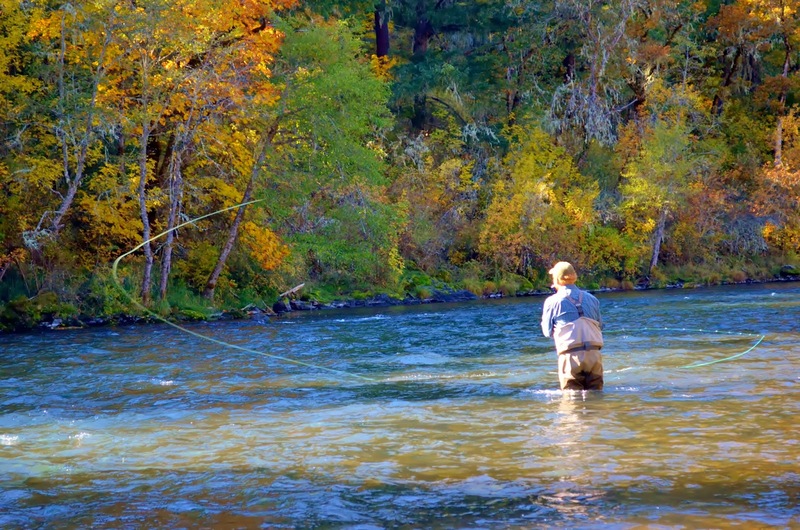 Here are some top producers for the Upper Rogue River. Gotta Love October! Match the October Caddis Hatch on the Rogue River! Halloween Fly-- A top Rogue River Producer for rainy days. Why they eat them!!! 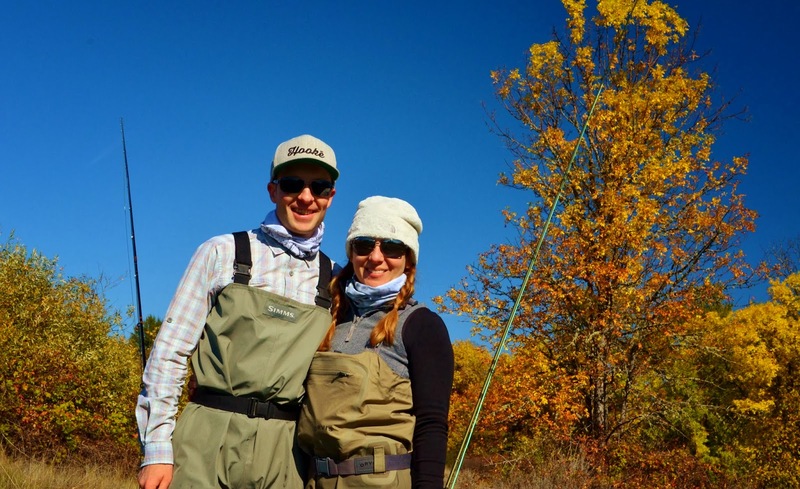 October Caddis bring Rogue Steel to the bank! 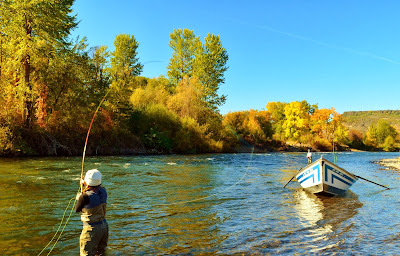 Labels: Rogue River, Rogue River Cutthroats, rogue river steelhead, Rogue river steelhead fly, Southern Oregon guide, Swinging for Rogue River Steelhead.